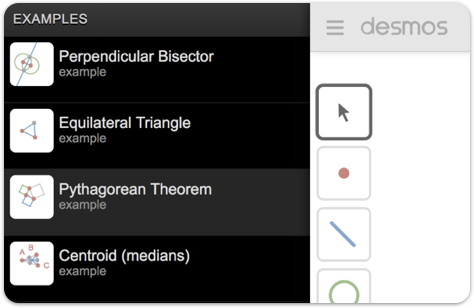 Desmos is proud to announce the release of our geometry tool. Want to learn how to use the tool? You're in the right spot! Watch the introductory video on the right, then dive deeper with the resources below. Looking for some challenges to level up your skills? Check out our Geometry Scavenger Hunt. Once you've learned the basics of the point, line, and circle tools, take your Desmos geometry skills to the next level with our pre-built construction tools. Looking for some construction inspiration? Click the "three lines" icon in the top left corner to access our examples menu. Take your geometric explorations to the next level with transformations! Get started with a video and several examples.